Two people have been killed and four others seriously injured in a shooting at a German nightclub, the police said. The 34-year-old suspect died after suffering life-threatening injuries in a gunfight with police officers outside the venue in the city of Konstanz, near the Swiss border. 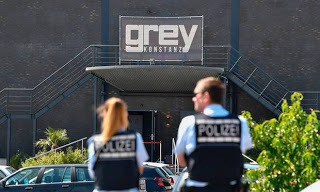 Police had rushed to the Grey nightclub on Max-Stromeyer-Strasse shortly after the shooting began. One person was killed inside the club and three guests were seriously wounded. A police officer was injured in the exchange of fire with the suspect, but police say his injuries are not life-threatening. Police said the gunman was identified as an Iraqi citizen who was not an asylum seeker. Konstanz police spokesman Fritz Bezikofer said, “The motives of the man who acted alone are unclear.